Annually hundreds of student from Nepal and India, reach destination countries for Medical education- MBBS and Masters ( Post graduate) degrees. Among the destanation nations, Bangladesh,China,India and Philipines tops the list. In this Section, we want to elaborate on Medical Education in Bangladesh. Bangladesh MBBS products are considered to be good and hard working. 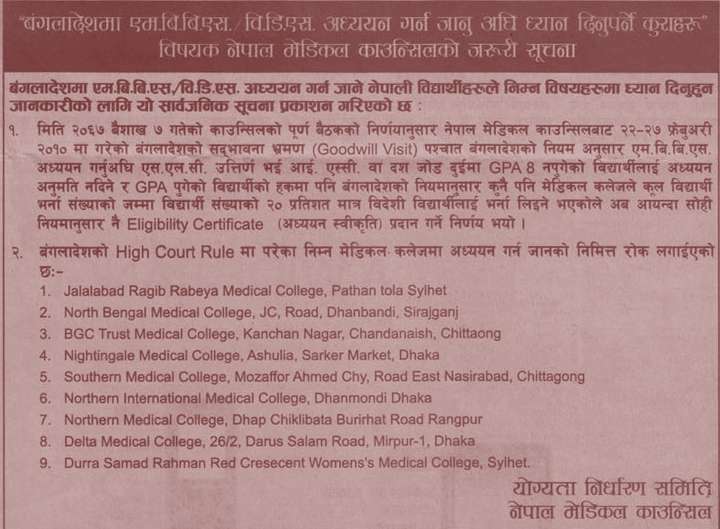 MBBS in Bangladesh is a good option as there is limited seats in Nepal Government scholarship seats are also available. Among the best Medical Colleges of Bangladesh preferred by Nepalese are- Chittagong Medical College, Dhaka Medical College, etc. The Fee structure is cheaper compared to Colleges in Nepal and the quality of education is even better. However MD or PG in Bangladesh is not a good choice for Nepalese. It is know to be very tough and failure rates are quite high. Many have returned back within the first 2 yr of PG. Bangladesh Embassy offers scholarship for deserving students annually. I am Dr.Ghassan salameh syrian nationality having MBBS from India and i completed 4 years General surgery in gevernment Hospital in Syria damascus and i am still practicing in Surgery department. I am seeking an Addmision in general surgery or plastic surgery in Dhaka if possible..
We aren’t official site for processing such admission request. 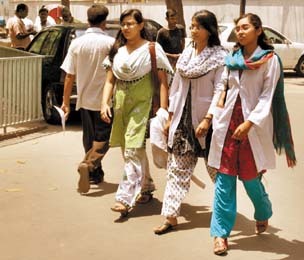 You can apply to Medical colleges in Bangladesh through Embassy or Websites. Sorry for not being able to help in this case. sir would u please tell me what is PGA and how is it calculated for applying to bangladesh? hello,i am.an indian citizen and i.want to know the eligibility and procedure for applying admissions.in.pg(medicine) in bangladesh,can.anyone help.me finding it out and also.if you are offering any scholarships for foreigners for.postgraduation? hello,can.anyone help.me to.know.the procedure and eligibility criteria for applying admissions.in.pg(medicine)in bangladesh.i am an indian citizen and want to study my pg in.bangkadesh.so.please anyine.guide me and also.if they are offering any scholarships for foreigners in postgraduatiin? I did MBBS from India and now I want to join post graduation in dermatology in bangladesh medical college… How to apply and what is the fee structure?? ?